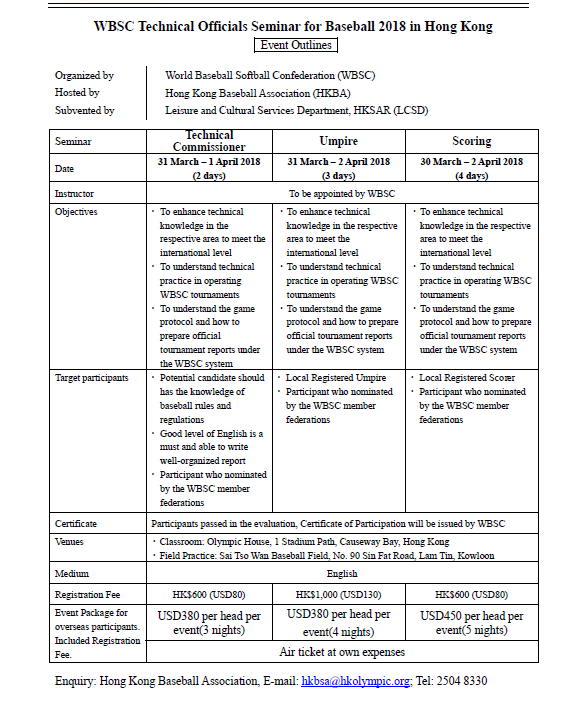 World Baseball Softball Confederation (WBSC) is inviting its member National Federations (NF) to nominate the participant(s) to the WBSC Technical Officials Seminar in Hong Kong, presented by WBSC experts from March 30 - April 2, 2018. NFs can nominate the participants by e-mail to Hong Kong Baseball Association (HKBA) by 31 Jan 2018. HKBA will then take care of registration and logistics and will also assist the participants with the application of Hong Kong VISA. All costs related to the participation to the seminar are to be covered by the NFs or the participants themselves.